The Supreme State Audit and the Albanian Institute of Sciences (AIS), engaged through a cooperative agreement for the exchange of data between institutions. 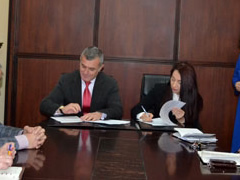 The agreement was signed by the chairman of SSA, Bujar Leskaj and the executive director of the Albanian Institute of Science, Aranita Brahaj. Pursuant to this agreement, SSA will engage in exchanging data of mutual interest, opening a window of communication with the public in order to increase transparency and modernize the institution. Through this cooperation, it will be created the possibility of using various data published by Open Data Albania which is a serious project appreciated from both within and outside the country for the quality of data and analysis that it prepares and publishes. Through the implementation of this agreement, SSA is fulfilling the tasks for capacity building and enhancing professional standards in auditing, through training, workshops and other joint activities with the aim to modernize the institution and strengthening the fight against corruption. Brahaj, in turn, praised the cooperation and new approach of SSA to Civil Society, noting that this cooperation through the exchange of data will generate new ideas and will help in finding defects, improving the fight against corruption. Both sides expressed the determination to implement this agreement and the belief that a sincere cooperation between public authorities and civil society will give concrete results in increased transparency, improved economic analysis by using data on socio-economic indicators in Albania, aiming of improvement of governance.